Residents are urged to attend a second Public Informational Meeting Wednesday January 21 at 6 p.m. in Wil-Mar Neighborhood Center which will again be attended by the City officials. The initial public meeting was held on January 5 and was well attended by an estimated 75 people. Jenifer Street is a “collector” but is four feet wider than most streets with that designation. Reading online reaction to the proposals, the moving of the bus stops, trees, narrowing of the street along with what construction equipment is used is far from settled in the minds of residents who live on Jenifer and those who used the street regularly. There is a reason Jenifer Street, from Baldwin to where it is joined by Spaight, is 40 feet wide, eight feet wider then typical residential streets. From the late 1800s until the 1930s, a streetcar line ran from the storage barns on Fair Oaks Avenue near Atwood Avenue via Winnebago to Jenifer and then downtown. Madison’s first streetcar barn was located at 701 Williamson Street. An ice storm in 1935 killed, via downed power lines, the electric version of the streetcars which were already feeling the heat of increased bus service as well as mismanagement. But during that time, Marquette residents and those in the “streetcar suburbs” of the Atwood and Yahara developments used the line to get to and from work as well as to areas on the Near West Side. In the 80 years since the last streetcar served Jenifer Street the street width has made parking, traveling and sharing the thoroughfare with buses, bicycles and horseless carriages easier. Despite restricting access to Jenifer at Williamson Street to only buses, speeds or the volume of traffic has not always been affected as intended. 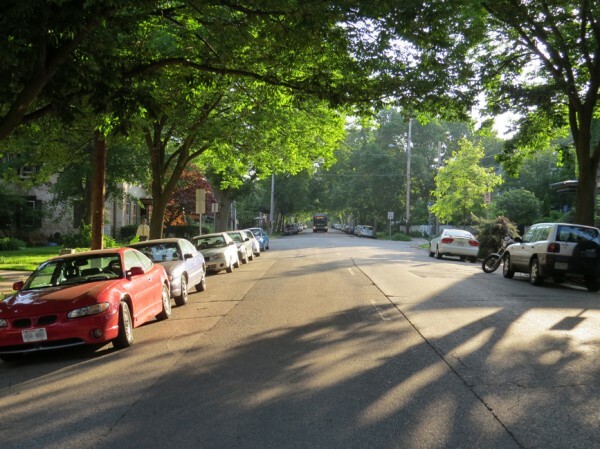 Marquette Neighborhood Association Traffic Committee Chairwoman Anne Walker hopes that the narrowing of the street along with other proposed traffic calming features will make a difference. Walker says the wider street tends to encourage faster speeds, often by vehicles that have been using the street to get to the outlying lakeside neighborhoods for decades. 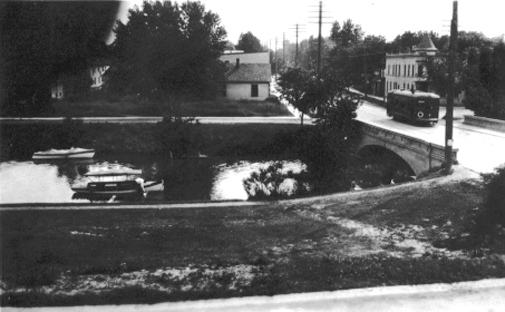 In fact, traffic flow through the neighborhood rankling residents can be traced as far back as 1924 when Orton Park neighbors rose up against a proposed boulevard through the park. Jenifer will be completely rebuilt much in the way south Ingersoll Street was in 2012. Jenifer Street from Spaight to Few Streets will be completely torn up. The roadway, storm sewers, water mains and if needed, driveways and sidewalks will be replaced. Special assessments are slated to be mailed to residents by January 9 which will indicate whether a property’s driveway and/or sidewalk will be replaced. The 400 block of Brearly as well as the 400 and 500 blocks of Paterson will also be replaced. 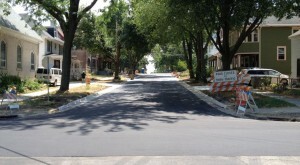 The 400 and 500 blocks of Few Street will be resurfaced. The City is proposing that Jenifer be narrowed two feet to 38 feet. 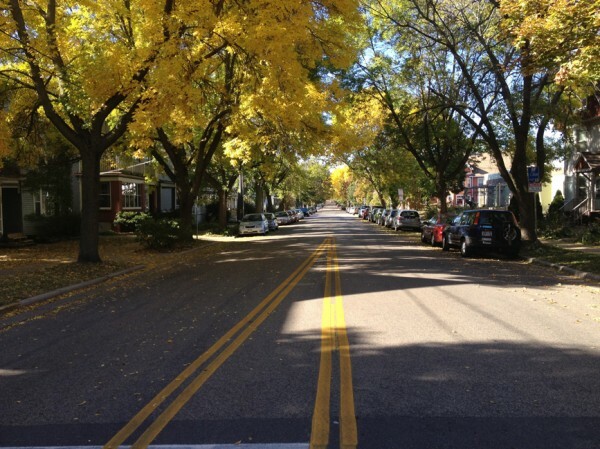 For perspective, interior streets are typically 32 feet, collector streets are 36. While Jenifer is classified as a collector it’s current dimensions obviously fall outside of the definition. To further slow traffic, bump-outs are proposed at the corners so that pedestrians are further into the street before stepping off the curb. Walker says that according to Engineering, parking space loss due to the bump-outs both with and without bus stops will be minimal. As part of the reconstruction the City is proposing to eliminate bus stops along Jenifer at Livingston/Spaight, Brearly and Few Streets. The bus stops at Ingersoll Street would move forward, across Ingersoll, to the other corner in their respective direction of travel. 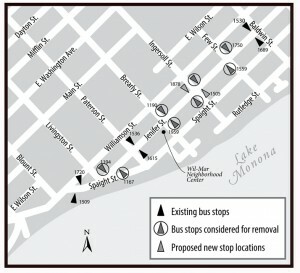 East Side resident Melanie Foxcroft was one of several to lament the reduction in bus stops pointing out in an email to the the Schenk Atwood Starweather Yahara Neighborhood Association (SASYNA) listserv that Madison Metro is eliminating two stops at the corner of the highly utilized Wil-Mar Neighborhood Center. 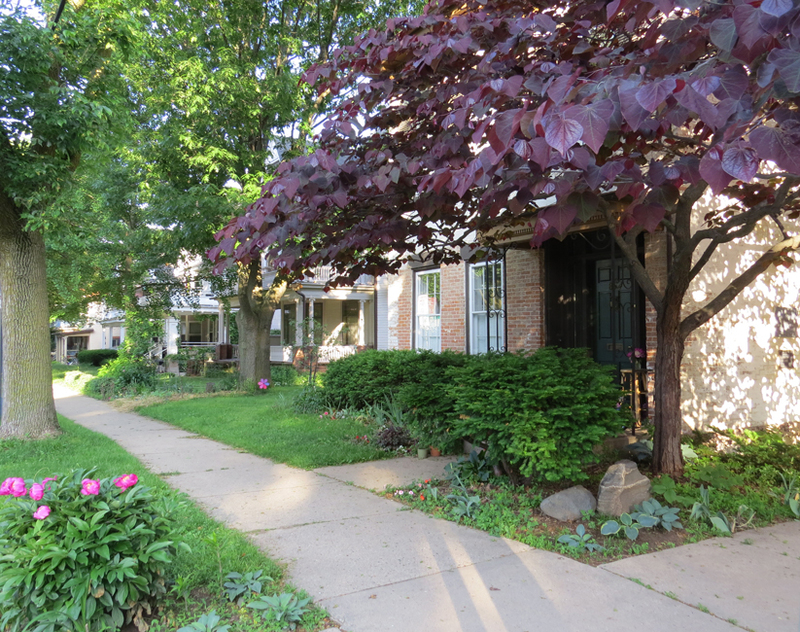 “Madison Metro and the Mayor are apparently not aware that there is a heavily used Wil-neighborhood center (Wil-Mar). Many users come by bus, including me in winter months,” Foxcroft wrote. “The center is used by elders, people with disabilities, children, low income and other users. The proposed elimination shows Metro’s lack of knowledge of and interest in neighborhood facilities, and, again, shows the height of insensitivity to elders, people with disabilities, children, and low income people without private vehicles, ” Foxcroft continued. During reconstruction the bus lines will temporarily be moved to Spaight Street. The historic Heyer-Jaquish Hotel may be susceptible to vibration damage from construction equipment. Of unique concern to at least a few residents who own historic homes along Jenifer is the impact of the construction process itself. The construction is proposed to start on April 27 and run until possibly November although the city will likely not have an end date until the bidding process is complete. To tear up the street entirely will take machinery to break up the concrete and asphalt, as well as devices that vibrate the soil to help prepare the new road bed. The City is urging all property owners to photograph their homes prior to the construction, including interior walls, to document their condition should the machinery in use cause damage. Anne Walker said when she asked the City about the construction impact at a meeting last fall, they said that other projects had gone well in areas with similar structures and the lack of bedrock under the soil would reduce the vibrations that might damage homes. However some residents are not taking the City at their word. Leslie Schroeder owns the pre-Civil War home at 854 Jenifer Street known as the Hyer-Jaquish Hotel. The house is seemingly on every possible historic list including the National Register of Historic Places and for good reason. 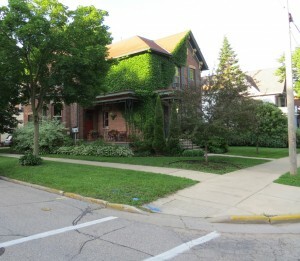 A pristine example of the native red brick, the Wagner house across the street from the Heyer-Jaquish house. The bus stop located in front on the right will remain. 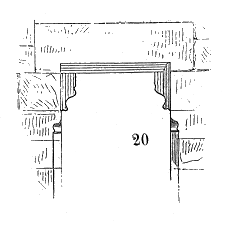 The Italianate style home has a sandstone rubble foundation and is one of only a few buildings remaining in Madison that is constructed with native soft red brick made on the shores of Lake Monona (painted white by a previous owner laments Schroeder) . Jenifer Street is located in the Third Lake Ridge Historic district and thus property owners have a special obligation to maintain their homes in accordance to historical constructs. Schroeder is concerned that the City is not living up to their end of the covenant when she has spent thousands to meticulously tuck-point the brick exterior using “a local masonry company who is sensitive to historic structures”. Schroeder says she has already had her home professionally photographed and retained legal representation in anticipation of possibly having to recoup damages from the city. Additionally, she would like to see assurances written into the contract between the City and the contractors that less destructive equipment be used. Walker says that they asked the City about making such allowances and their response was that the contractors could use smaller equipment but it would add additional expense and time to the project. Gary Tipler, who is an unofficial architectural historian for the neighborhood, lives in the former Harlow S. & Isabelle Ott Residence at 807 Jenifer Street and related similar concerns he expressed during the lead up to the Williamson Street reconstruction in 2011. 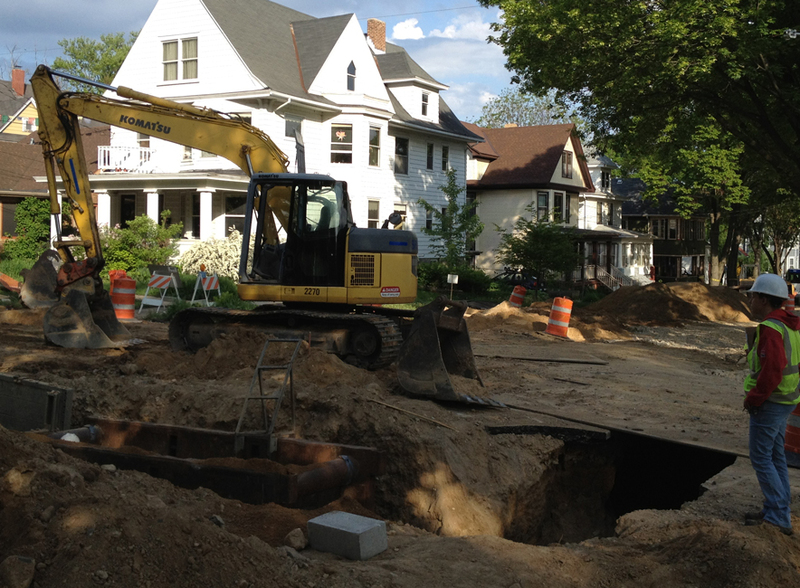 “The 700 block of Jenifer Street was done a few years ago and then that’s why I saw this…vibrating machine that looks like it’s out of a cartoon destroyer comic book. It does fracture walls and stone. It does wreak havoc on interior plaster,” Tipler said during discussion on the issue at the MNA Board meeting. 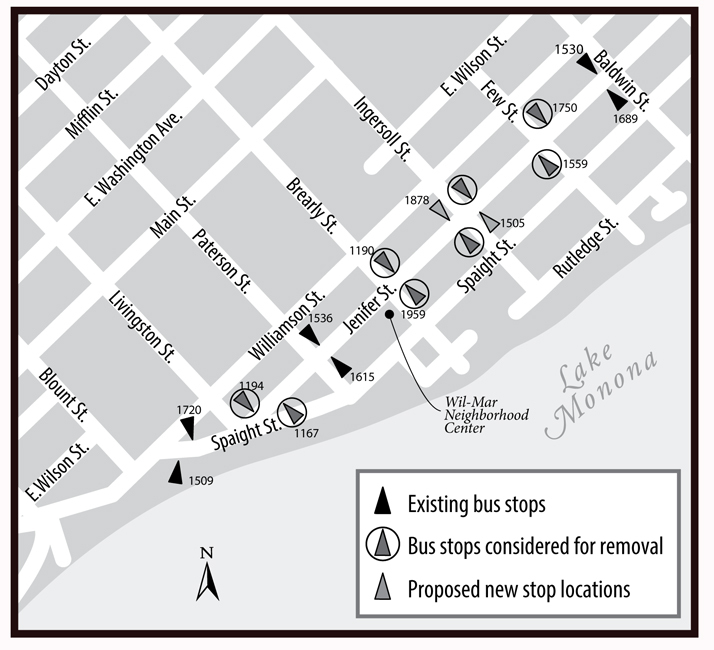 After the project, the bus stops at Ingersoll will switch corners. File photo. “Some neighbors complained that they had things falling off shelves. That was something that I brought up during the Williamson Street reconstruction,” Tipler said. “I remember Christy (Christina) Bachmann (Principal Engineer for Streets & Sidewalks) saying, “We’ll take a look at that'”. According to Tipler the City didn’t make any changes to the construction plan and multiple homes were damaged. “At least five property owners sued the city for fractures in the stone lintels and concrete and limestone lintels above almost all the windows,” Tipler said. 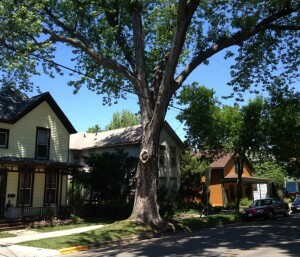 While the tree at center was removed due to old age, the tree at right was trimmed per power utility policy. One of the appeals of the Marquette neighborhood, especially Jenifer Street, is the majestic canopy provided by the stately ash, oak, and maple trees that line the streets. Lately the trees have had to fight battles on two fronts. The Emerald Ash Borer has claimed 44 trees along Jenifer Street which the City Forestry department has marked for removal. Twenty three other trees were treated. Those trees exist on what is known as the terrace (between the sidewalk and the street) and is city owned. 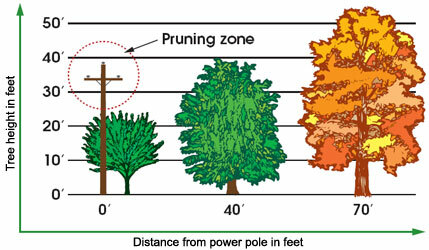 The City of Madison uses the Right Tree, Right Place criteria when determining what trees to plant or remove in those locations which are usually under power lines. Anne Walker says that the type of tree now allowed in that area are much smaller. Madison Gas & Electric also publishes a guide for those who want to plant near power lines but does not control what is planted. MG&E’s Steve Schultz says that trees maybe subject to trimming if they encroach upon power lines. The City says that Jenifer Street does not qualify for the underground utility program and there are no funds available. Walker says the other issue is storm water run-off since drains only exists on the side streets to Jenifer in some places. The City says that they are looking at possibly creating terrace rain gardens in the 500 block of Paterson Street and 400 and 500 blocks of Few. Residents who are interested should contact the City to see if their property meets the eligible criteria. There was brief MNA Board discussion during the December meeting about issuing a letter opposing the construction project this year but at least one member said it would be important to have alternatives ready to present to the City. District 6 Alder Marsha Rummel told the Board that it would be difficult to delay the project since the City didn’t undertake many large projects in 2014 and Jenifer Street is one of their main projects this year. The Board decided to wait to gauge residential input at the January 5 meeting before deciding whether to act. Whatever is decided, bidding for the project is slated to open in early March. Requests for comment from City of Madison Forestry and Madison Metro so far have not been returned. [Update – 01/05/2015, 9:20 am] Comments added from MG&E. This entry was posted in Madison, Madison Commentary, Willy Street, Willy Street Commentary and tagged Anne Walker, Christina Bachmann, City of Madison, Few Street, Forestry, Hyer-Jaquish Hotel, Ingersoll Street, Jenifer Street, Leslie Schroeder, Livingston Street, Madison Metro, Marquette Neighborhood Association, National Regiser of Historic Places, Orton park, Paterson Street, SASYNA, Spaight Street, Traffic Engineering, Williamson street by TheEastSider. Bookmark the permalink. These changes will also affect cyclists, who have to navigate between parked cars and traffic (including buses). On a narrower street we may have to use the whole lane if we want to stay out of the “door zone” of parked cars, which inconveniences and sometimes angers motorists. Cyclists who nevertheless try to ride to the right of traffic will be forced to merge at the bump-outs. The whole plan seems to have more disadvantages than advantages. It’s not like Jenifer Street is hard to cross anyway; it’s just not that busy. And why would anyone want fewer trees and fewer bus stops? Some residents support eliminating bus stops so both buses and cars can speed up along the street without having to stop for buses stopped at those pesky bus stops. Is this what residents want, for cars and buses to go faster along Jenifer Street? I can think of a few reasons why we want cars and buses to slow down, not go faster! Also, I want to encourage people to take transit, bike, walk or even carpool, but not use private vehicles, to their next destinations. Vehicles are the number one contributor to the carbon dioxide build-up causing global warming, and transit produces so much less pollution per trip than cars because transit carries so many people per trip. The science is there, folks, and only we can do something about it! The city should put zip-lines and towers at all Jenifer Street intersections plus giant sling-shots for bikes. No pesky pedestrians to slow drivers that have important meeting to get to. Plus zip-lining over streets will enhance our neighborhood weirdness. The zip lines should all end in Central Park above the skate park which is where all the cool people are going anyhow. Thanks for this interesting and informative article. Please fix the link “Right Tree, Right Place criteria”, it’s not working.